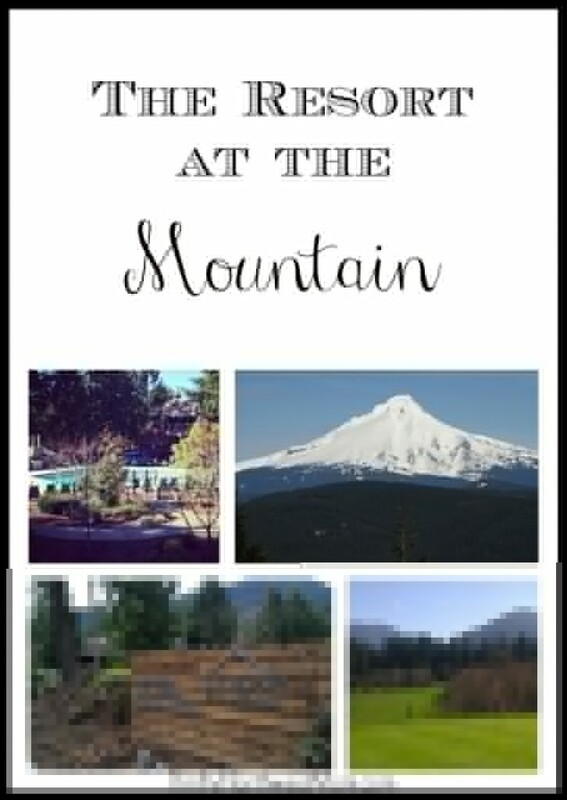 We recently traveled down to the Mt Hood area for a few days to check out all that the area has to offer and we had the opportunity to stay at the Resort at the Mountain in Welches, Oregon. We had stayed here about 3 years ago in the spring for a short visit, but didn’t get a chance to see much of the resort or the surrounding area as it was a short stay. So, I was excited to have more time check out the resort and explore some of the fun winter sports around Mt Hood. I’ll be sharing more about the winter sports options in a post later this week, but first I wanted to tell you about this family-friendly and affordable option for a stay at a resort close to Mt Hood. Stay tuned in a few days, too, as we will be sharing about an awesome giveaway for the Resort at the Mountain resort for Thrifty NW Mom readers!! Welches, Oregon is just a short jaunt (less than an hour away) from Portland and about 3 1/2 hours away from Seattle, so it’s not as far as it may seem if you’re not familiar with the area. If you’re planning on visiting Mt Hood, there are several different options of places you can stay to access the mountain & all the areas around the mountain. Timberline Lodge – right on the side of Mt Hood at almost 6,000 ft; however, prices start at $250 & up for a small room. Government Camp lodging – Government Camp is the closest town to Mt Hood as it’s just 15 minutes away & located at 4,000 feet up the mountain. The types of lodging you’ll find in Government Camp varies between hotels, condos/timeshares or vacation rentals. They do not, however, offer any full resorts with a variety of activities all on location at the resort. You’re paying higher prices to be closer to the ski resorts or the mountain activities in the summertime. 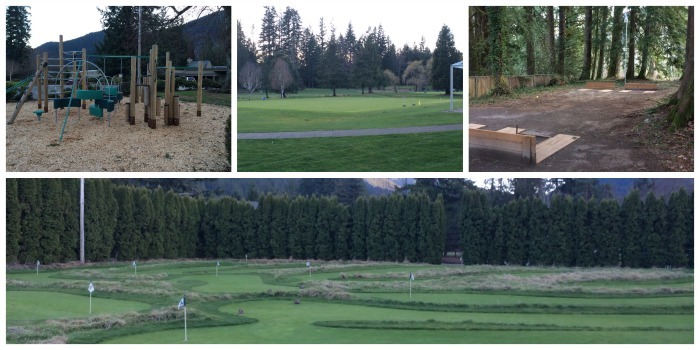 The Resort at the Mountain is nestled in the woods in the beautiful Salmon River Valley. This is the only full-scale resort with a variety of activities to keep families busy & active. My husband and I were visiting the resort along with travel writers from around the country & as one travel writer said, “Oregon is versatile. Yesterday guy on my trip skied Timberline Lodge then played golf at the Resort at the Mountain.” You can take advantage of the winter sports on the mountain but then head back to the resort to golf, head to the spa, relax in the heated outdoor pool & more – perfect for busy families to keep your kiddos entertained & enjoying the great outdoors! The exterior of the resort’s buildings are a bit more rustic looking, but as you can see from these pictures, the inside of the resort rooms, as well as the bathrooms are very modern, luxurious and spacious. We stayed in a room with a king sized bed and a fireplace & fold out couch and it still had tons of room to feel comfortable with your family. The balcony overlooked the pool and courtyard area, with plenty of trees to make it very cozy & give you the feeling you’re in a cabin (but with all the modern conveniences!). They do offer options of 2 queen sized beds, too, if that’s what you prefer for your kids. If you’re looking for larger accommodations, they do even offer some larger suites situated on the golf course and even a few vacation homes on site that you can rent as well. The Resort at the Mountain is a great option – not only for their beautiful location, nestled in this gorgeous valley & surrounded by the woods, but also the variety of activities they offer on-site as well as their proximity to so many activities around the area. There are some great activities for kids and families, as well as activities for just the men & women, too, if you’re wanting to have some time to yourself while you’re on your family vacation or if you’re there on a couples getaway. In my opinion, this is what really makes the resort stand out from the other lodging options at Mt Hood with the large number of activities you can take part in right at the resort, in addition to all the activities around Mt Hood. Outdoor pool & hot tub – In the courtyard & in the middle of all the lodging is their outdoor pool and hot tub. The pool is heated all year-round so we actually went swimming several times & even once at night. I’ll admit that it was a bit chilly at night, but you can warm up in the hot tub. It’s not everywhere that you can swim under the stars and moon at night up in the mountains! 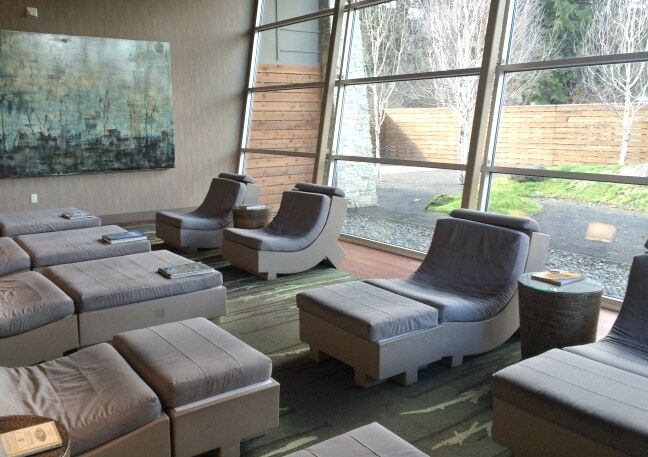 Spa – If you’re looking for a little relaxation, they have a great spa on site & some of their deals do include a resort credit, which you could use at the Spa (as well as at the restaurants, golf course, etc). The spa treatments are professional & well-done – very relaxing if you’ve spent a day on the slopes or out hiking. I love this relaxation room they offer which you can hang out in before or after your spa treatment with a fireplace, magazines, tea, & snacks. Fitness Center – They have a fitness center out near the golf course, with Keiser equipment, Stair Master & Life Cycle equipment. Kid Activity Center (coming soon) – They are working on adding a Kids Rec center room with pool table, foosball, games & more. This should be added by the summertime of 2014. Firepit – during holidays & summertime they will be having a fire pit where you can bring supplies & roast S’mores. They have S’mores supplies on hand to purchase if you forget your supplies. I will be sharing a separate post with ideas of all the different activities available around Mt Hood, but what I love about this area is there is so much to do within about 20-30 minutes. There are also some great day-trip opportunities about an hour away if you want to head over to the Columbia Gorge area for the day & see all the waterfalls in the gorge, visit Hood River, go rafting or fishing on the Deschutes River in Eastern OR just over the mountains & more. At the resort, they have a Nature Concierge, Nate, who has an amazing wealth of knowledge about the local area & he can share information all about the local hikes, as well as any winter or summer sports to participate in while you’re there. Nate is definitely someone to seek out when you arrive at the resort to learn all you can about the area. He gave us several “can’t miss” hikes for families & we followed his advice & checked out the Little ZigZag Falls trail about 10 -15 minutes away, which is now one of our new favorite hikes & perfect for families. (I’ll be sharing more info about that hike this week). Hiking – I loved the fact that they have a little room just off the lobby all devoted to information about the local area, including this station full of pamphlets about all the hikes in the area. 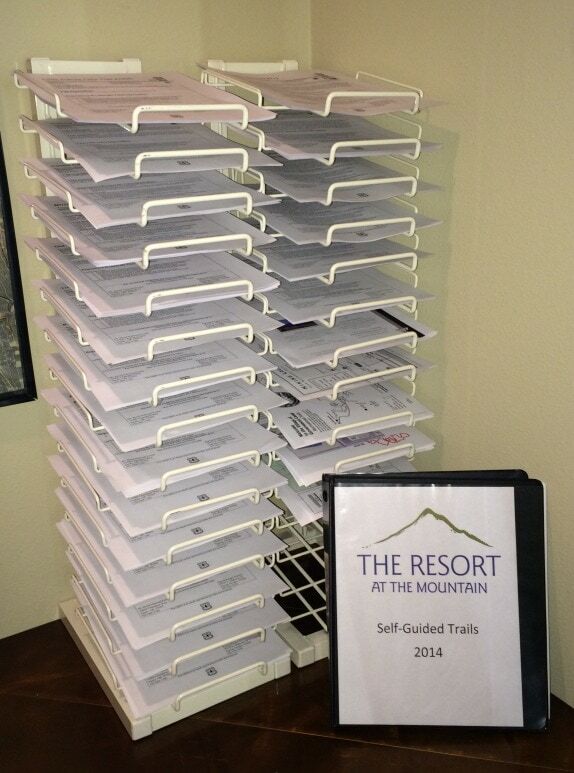 The sheets give information about where to find the hike, the level of difficulty & what you’ll find along the hike. Fishing & Fly Fishing – the Salmon River which runs along the grounds of the Golf course is a great place to go fishing. It’s well-known for its fly fishing opportunities, fishing for trout, as well as regular fishing for salmon. The Deschutes River is not too far away across the mountains as well, which is very popular for fly fishing. Mallard Cafe & Pub – open seasonally – this was not open when we were at the resort – it will be back open in April (closed Nov – April) but wow, the view is outstanding from this location as you can look out over the Salmon River valley, right at the base of the foothills of the mountains and The Courses golf course. It looks like this is a great place for more inexpensive & casual food, perfect for families. Here are a few of the restaurants we’ve tried around the Mt Hood area if you’re looking for a place to eat. I’d love to hear what your favorite restaurants are, too! 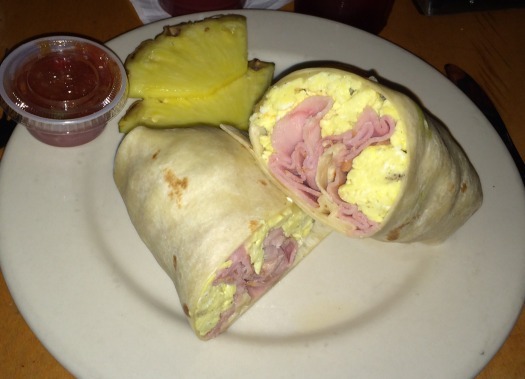 Wraptitude – located in Welches, this is a great place to come for breakfast, lunch or dinner. They offer hot & cold wraps made from all natural ingredients, as well as smoothies, espressos & more. One option they offered was a peanut butter, granola & banana wrap that was just $4.75 & one of the gals in our group said that she was full after eating just one half, so you could then could take the 2nd half to go for another snack or meal. So that’s a healthier option for breakfast on a budget to fill you up! El Burro Loco – This is a Mexican restaurant in Welches with delicious food & a fun atmosphere. 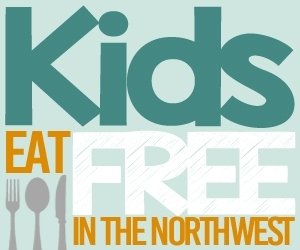 We headed here with our girls on our last trip to Mt Hood & felt like they had reasonable prices – most items ranged from $8 – $12 & kids meals were $3/ea. Mt Hood Brewing company – This restaurant is conveniently located right in Government Camp, just off Highway 26 & with a view of Ski Bowl, just across the highway. Great food with hand-tossed pizzas, burgers, mac & cheese & more, as well as hand-crafted beers made in the brewery located on site. High Mountain Cafe – we had lunch here before heading out of town & it was a great place to grab a sandwich with a variety of options or make your own sandwich, which is what I did! A fun idea would be to grab sandwiches to head out for a picnic on one of the trails or even just buy some meat & cheese & crackers in their deli area to make your own picnic foods. Check out the Special Offers Page – Head to the Resort at the Mountain’s website & check out their Special Offers page to see a list of various specials. For example, if you book your stay 3 weeks or more ahead, you can save 20% off their best rates. For the month of April under the “Value” section, they are offering a Buy 1 Get 1 Free special. From April 1 – 30th, 2014 – stay Sunday – Wednesday and get your 2nd night free. 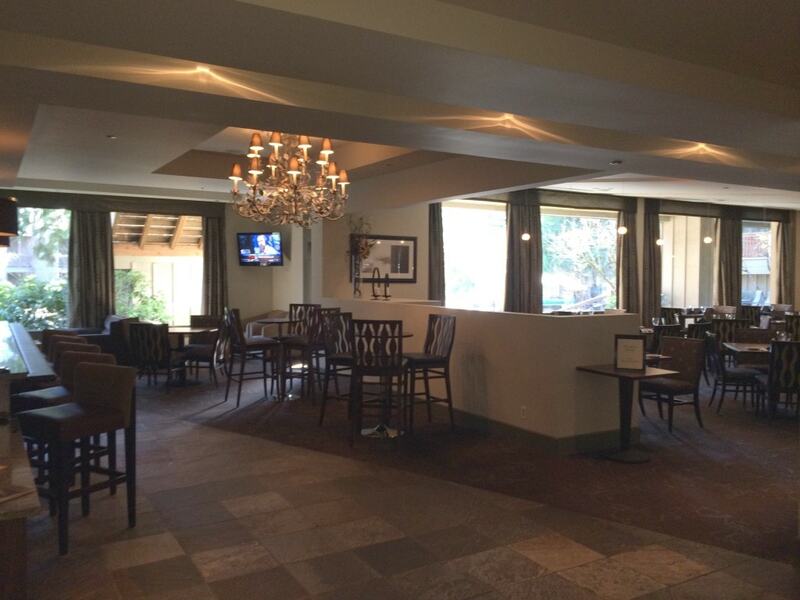 You can also get B1G1 lunch entree at Altitude restaurant & B1G1 Spa Treatments & Golfing. You can also sign up for their email newsletter & occasionally they may send emails with special offers. Stay During the Off-Season – The busiest season for this resort is in the summer or in the winter months, so you’ll find lower rates in the spring & fall. You can still ski in the spring & fall as Timberline Resort offers skiing almost year round (it depends on the snowfall, but they often will only close for maybe a month or two in August/September). You can find discounted ski packages during the off-season as well. Plus, there are so many great places for hiking year-round that you could still find quite a bit to do in the off-season as well. Follow the Resort on Facebook and Twitter – It’s always a good idea to follow your favorite hotels & resorts on their Social Media sites as they will often have last-minute specials or specials only for their Facebook & Twitter followers. Currently, the Resort is offering a $50 dining credit for stays during the week through April 15th for their Facebook & Twitter followers. Check out daily deal sites – The Resort at the Mountain has offered deals on sites such as Groupon, Living Social & Amazon Local, so make sure to check there for a package deal, too. Right now, Amazon Local is offering a discounted 1 or 2 night stay at the resort with a $50 or $100 resort credit (as low as $149/night), depending on how many nights you stay. Just search “Resort at the Mountain” to find the deal. Overall, I am really impressed with both the Resort at the Mountain for the beauty of the location, but also the variety of kid-friendly activities. We enjoyed the resort when we visited several years ago, as the location is beautiful in the valley of the mountains, but we really didn’t have a chance to explore the area too much. Spending several days gave us the opportunity to really get to know this area around Mt Hood & I honestly think it is a location that more Northwesters should consider for a vacation because there is just so much to see & do, especially if you love to get out & enjoy all the beauty the Northwest has to offer. 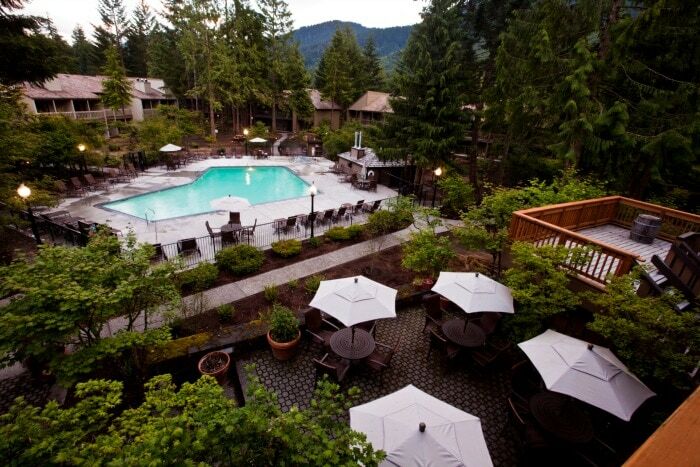 It’s only about 3 1/2 hours from Seattle and you don’t have to deal with steep mountain passes to get there as this resort is on the western side of the mountains, so it’s definitely a location to consider for a mountain getaway! Have you stayed at the Resort at the Mountain before? What did you think? 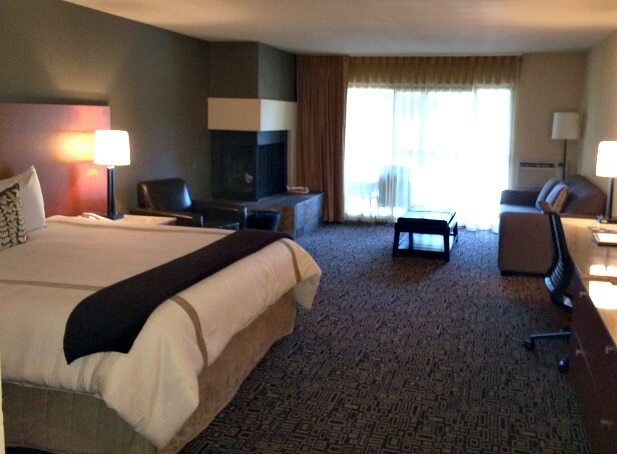 Stay tuned as we have an exciting giveaway coming up for the Resort at the Mountain in a few days!! Disclosure: The Resort at the Mountain provided me and my husband with a stay at the resort, so we could try out the different activities to be able to share with you what we thought about the resort. All opinions are completely mine. See our disclosure statement for more details. I love your photos and the review. 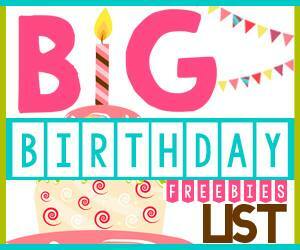 I’m excited for the giveaway! Thank you for the chance to this beautiful resort. It looks relaxing. Just what a mom of 3 needs. Getting married at the courthouse after 9 years together end of June!! This would be a amazing honeymoon! !